Stretch marks, also known as striae, often occur when the skin is quickly stretched and exceeds the strength of its flexibility. The marks are usually long and narrow lines with an off-color hue. You may also notice white, blue, red, pink or purple streaks on your skin. According to a survey, more than 50% of women have stretch marks during pregnancy. And they usually form in the last three months. When you are pregnant, your skin layers will stretch over as your baby grows fast. In addition, the changes in hormones in your body during pregnancy can also lead to loose skin. These factors can cause stretch marks on your abdomen, breasts, and thighs. Stretch marks often occur during the pregnancy or the periods of rapid growth and drastic change in your weight. Although pregnancy is the main reason for stretch marks, other causes such as weight gain, bodybuilding and adolescence can also cause stretch marks. Stretch marks usually appear in the abdomen, but it can also appear in the thighs, buttocks, breasts, upper arms, waist and hips. They are a form of scarring on the skin surface. Not only do women suffer from stretch marks, but men also get it. Stretch marks may decrease over time but they will not completely disappear. Fortunately, there are many natural ways to reduce the appearance of stretch marks. To get rid of stretch marks you can moisturize and nourish your skin from both inside and outside. The following article discusses some effective ways to get rid of stretch marks fast. A healthy diet is very effective in preventing stretch marks during pregnancy! Not only benefit you and your baby, it will also increase the elasticity of your connective tissue and keep your skin smooth. Eat more foods rich in protein, zinc, antioxidants and fatty acids. Fatty acids such as Omega-3 that can help repair your damaged skin. Foods rich in fatty acids include fish, walnuts, chia seeds, Hemp Seeds, egg yolks, mackerel, and cod liver oil. Foods rich in anti-oxidants include sweet potato, garlic, dark chocolate, avocado and green tea. Zinc can help improve the health of the skin. Zinc-rich foods include sunflower seeds, pumpkin seeds, red meat, dark chocolate, spinach, and chickpeas. Vitamin-rich foods include yeast extract, bell pepper, fortified cereals, whole grains, fruits and a lot of green vegetables. Vitamin C can help to regenerate and strengthen damaged tissues. A lot of vegetables and fruits such as oranges, lemons, oranges, avocados, and broccoli are rich in vitamin C.
According to the latest study, vitamin D can also reduce the risk of stretch marks. You can eat more bread, cereal, milk or yogurt to intake vitamin D. In addition, regular sun exposure is also a good way to get vitamin D.
Vitamin E contains tocopherol that is a natural antioxidant. It also contains squalene that help promotes cell growth and prevent the occurrence of stretch marks effectively. Apply the Vitamin E oil on your breasts and massage it in circular motions for 5-10 minutes. This can help the skin absorb the oil effectively. Repeat this process 2 times a day. Olive oil contains polyphenols, phytosterols, and vitamin E that can enhance skin’s elasticity and collagen production. It also contains antioxidants and essential nutrients that can accelerate the healing process of skin cells and reduce the scars. Apply olive oil directly on your skin and massage the area in circular motions for five minutes. This allows your skin to absorb the oil by wrapping the area using saran wrap. You can also combine olive oil with castor oil for a more powerful punch. Mix one teaspoon each of these oils and applies the mixture to the affected areas. Massage the skin for 10 minutes and cover the area with a cloth. Alternatively, you can combine equal amounts of olive oil and fresh aloe vera gel. Apply this mixture two to three times a day. Egg whites contain high levels of proteins and amino acids, making it one of the best natural methods on how to get rid of stretch marks at home. In this method, you will only use the egg whites and save the yolk for other purposes. Take two eggs and whip the egg whites with a fork. After washing your skin, apply egg whites on the affected area. Let it dry completely before washing off with cold water. Once you are done, apply coconut or olive oil to moisturize your skin. Repeat this treatment once a day until you are satisfied with the results. Aloe vera is a well-known herb for treating various skin problems. It contains soothing and healing properties that can help in reducing the appearance of stretch marks and other skin blemishes. Take a big aloe vera leaf and cut it in half. Extract its gel and apply it directly to your skin. Let it sit for 15 minutes or more and rinse the skin. Repeat this treatment daily. Alternatively, you can mix one-fourth cup of fresh aloe vera gel with five vitamins A capsules and 10 vitamin E capsules. Apply the mixture to your skin while rubbing gently. Allow your skin to absorb the gel and oils. Follow this process once a day for best results. Another option is to blend 1 cup of aloe vera, 2 teaspoons of almond oil, and 2 teaspoons of honey. Apply this to the scars and let it sit for 45 minutes. Drinking plenty of water can help keep your skin and connective tissue soft, this can help prevent stretch marks. It is best to drink two to three liters of water a day. Try to avoid caffeinated beverages such as coffee. Caffeine can disturb the hormone levels in your body and increase the risk of developing stretch marks. In addition, caffeine will deprive your body of moisture and sugar, causing the skin to age prematurely. A dry tissue is usually not as resistant as tissue that is sufficiently hydrated and is more prone to injury such as the stretch marks. If you drink coffee, try to drink a lot of water to balance your fluid intake. Your connective tissue is under great pressure during your pregnancy due to your baby’s growth. Regular massage of the skin on the abdomen, breasts, buttocks, and thighs can promote blood circulation and strengthen the elasticity of the connective tissue. When you are showering, you can use a natural bristle brush or loofah glove to massage in circular motions. You can also massage the affected area with creams, oils, or lotions gently. This will not only make the stretch marks disappear but also smooth your skin. A changing shower is a good way to fight any stretch marks. It lets the water run alternately warm and cold over your skin. Frequent changes in temperature can help stimulate blood circulation and promote the formation of new cells in connective tissue. As a result, stretch marks can also be reduced. If you are pregnant, you can still do some exercise. This not only keeps you fit for the birth but also helps you to prevent stretch marks. However, you need to choose easy exercise instead of sweating. Going briskly for half an hour, two or three rounds of swimming per week is enough to prevent annoying stretch marks. In addition, pregnancy yoga is a miracle weapon against skin cracks. Targeted muscle building is a good alternative to endurance sports for pregnant women. However, this anti-stretch mark method is not suitable for all women because the exercises are quite strenuous and it should be done at least every two days to be effective. Exercises such as squats or diagonal situps are particularly suitable for you. This can help prevent stretch marks on abdominal, thigh and thigh muscles. However, you should do these exercises only at the beginning of your pregnancy. Exfoliating can effectively help remove dead skin cells and promote new skin cell growth. In a bowl, mix 2 tablespoons brown sugar and 2 teaspoons of lemon. Apply this mixture to the areas to be treated and scrub your skin for 2minutes. Rinse and renew once a week ( 2 times maximum). Before applying this mixture on all of your skin, do an allergy test on your skin. There are various creams, scrubs and body lotions to get rid of stretch marks on the market. Regular use can help keep skin moisturized and avoid streaks and cracks. If you are using skin care products to prevent stretch marks, it is best to use after bathing. It is most likely to receive cream and its ingredients when your skin is still a bit damp after drying. Stretch marks are usually caused by the drastic change in your weight. Therefore, maintaining a healthy weight is the most effective way to prevent stretch marks. Eat a healthy diet and exercise regularly is a good way to control your weight. The ultraviolet rays in the sun will make the stretch marks become darker. Make sure to use a sunscreen with SPF 30 to protect your skin when outdoors. Stretch marks not only appear on the abdomen and leg but also appear on the breasts. This is because the volume of women’s breast changes very quickly compared to other areas of the body. Pregnancy, menstrual cycles, puberty, or weight gain and loss can result in the rapid change of size of the breasts, leading to stretch marks on the breasts. Use a warm towel to compress your breast before going to bed every night. Apply a nourishing cream or lotion to your breasts and gently massage. Maintaining regular exercise can help improve blood circulation and maintain skin elasticity. Eat foods rich in vitamin E and vitamin K, such as dairy products, liver, tomatoes, and green leafy vegetables. A steam bath can help open the skin pores on the breast and get rid of stretch marks. Drink plenty of water every day, this will hydrate your skin and get rid of stretch marks on your breasts. 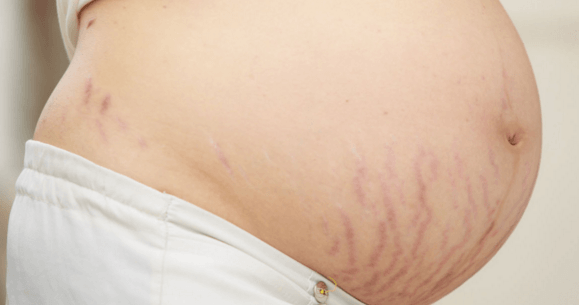 Weight gain is the most common cause of stretch marks outside of pregnancy. A rapid increase in body weight can cause your skin to be overstretched, leaving an unsightly stretch mark. Many people ask if weight gain can lead to stretch marks, do stretch marks disappear after weight loss? Unfortunately, losing weight does not necessarily eliminate them. Conversely, the lines may get worse. After weight loss, the skin will get back to its position along with stretch marks. This will make stretch marks closer to each other and more obvious than before. However, there are some natural remedies to make the stretch marks less visible after weight loss. Drinking 8 to 10 glasses of water daily. This can help the skin maintain moisture and elasticity, reducing stretch marks visibility. Apply lotions, moisturizing cream or olive oil to affected areas. Then massage the affected area gently with your finger. This can effectively help rebuild collagen and reduce the stretch marks. Potatoes contain polyphenols, phytochemicals, and carotenoids, which help in enhancing the texture and appearance of the skin. The vitamins and minerals in this vegetable can accelerate the growth of skin cells. Cut a piece of potato and apply it to your affected area. Let it dry for 5-10 minutes before rinsing off with lukewarm water. Lemon juice is a natural bleach that can effectively lessen your stretch marks. The acidic properties of lemon help treat stretch marks, pimples and other blemishes. Cut a fresh lemon and squeeze the lemon juice. Apply it on your skin for 5-10 minutes before washing it off with warm water. In addition to pregnancy or gaining weight too fast, working out can also lead to stretch marks. Rapidly building muscles will stretch your skin. When it exceeds its elastic capacity, stretch marks appear. Stretch marks often appear on the thighs, back, chest and insides edges of your arms. Here are some useful tips for removing the stretch marks from working out. Eat a healthy diet such as vegetables, fruits, leptin and whole grains. These foods can help produce collagen that can repair your over-stretched skin dents. Avoid excessive weight you lift during exercise. Fast-growing muscles can damage your skin and lead to stretch marks. You can use a lighter weight instead and increase the number of repetitions appropriately. Tretinoin cream is another effective remedy that can make your stretch marks lighter. Apply this cream directly to your affected area 1-2 times daily. This cream can help boost collagen production and lighten redness on the skin. Male Stretch Marks are common in bodybuilders, athletes and other people who have either increased muscle mass or lost weight too fast. Rapid weight loss or weight gain will disrupt the production of collagen and lead to skin tear. This will result in stretch marks on your skin. Male stretch marks often appear on the chest, upper arms and shoulders. Here are some useful tips to help get rid of male stretch marks. Moisturize your skin with a men’s moisturizer containing vitamin A and hyaluronic acid. Apply the moisturizer and massage at least twice a day. This can helps reduce the stretch marks and boost your skin health. Exfoliating regularly with a men’s scrub can help reduce the appearance of stretch marks. You can do this 3-4 times a week. This can help remove dead skin cells and stimulate new cell growth. Try to gain muscle or lose weight gradually, 1-2 pounds per week is an ideal rate. Excessive skin stretching speed will increase the risk of stretch marks. Eat fruits and veggies rich in vitamin A and E. These natural antioxidants can help stimulate collagen production. Moreover, they’re also great for your overall health. Alternatively, you can use a vitamin A cream to supplement vitamins. It’s easy to use and help hydrate your skin effectively. 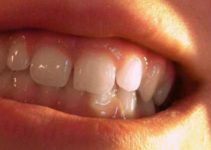 Why Is It So Important To Correct An Overbite? Ya..its good information and mainly no side effects…but if we check the result means… its nothing…. I tried many times and finally i heard about Dermalmd. After used that stretch mark removal serum i got my skin back!! !